← When is old enough suddenly not old enough? This entry was posted in civil rights, rkba, self-defense. Bookmark the permalink. 3 Responses to Finishing the murderer’s job? Oleg – thanks for these. I’m a Florida gun blogger, and I’m going to spread them around. 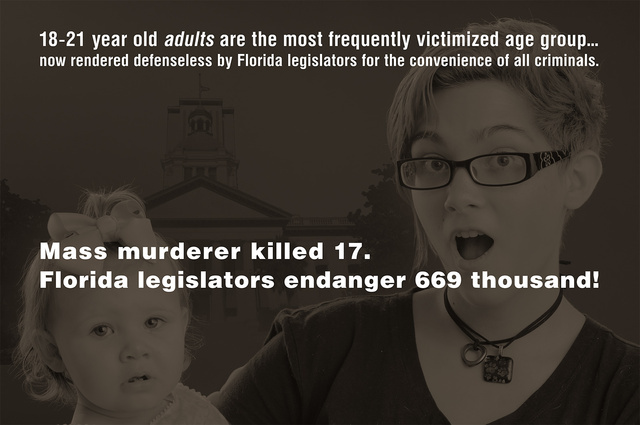 What our lawmakers did is a disgrace, yet they crow about how they defeated so many gun control proposals. I’ll concede that they did block outright assault weapons bans, magazine limits and some others, but they ruined otherwise good legislation (hardening schools, the marshal program, and a few other things) with this ban, a clause outlawing bump stocks with frighteningly vague words about “anything that can increase the rate of fire”, and waiting periods. I think they made being Jerry Miculek a felony. The real problem is the law includes ways to block the good parts but no ways to block the bad parts. I hope you’re being sarcastic and not retarded.